The Plowmen proudly present the World Premiere of Soldier, written and performed by Jonathan Draxton, and directed by Kevin O’Rourke (Mayor Edward Bader on HBO’s “Boardwalk Empire”). Soldier runs from December 11 – 22, 2012 in a limited engagement at HERE, located at 145 6th Avenue (Enter on Dominick, 1 block south of Spring) in New York City. Previews begin December 11 for a December 13 opening. Performances are Tuesdays – Sundays at 7pm. Tickets are $20 and can be purchased online at http://www.here.org or by calling 212-352-3101. 50% of the box office proceeds from the show will go to the Wounded Warrior Project (http://www.WoundedWarriorProject.org). The running time is 50 minutes. For more information on the show visit http://www.Facebook.com/CoinsForASoldier. Soldier tells the story of a German officer, Heinrich Weiss, who is trapped on the banks of the River Styx. Desperately searching for coins so that he and his men can secure passage across the waters, Heinrich will reveal his own personal history as well as the origins and facets of man’s love affair with war. Welcome to the River Styx, where you will be confronted with one soldier, one coin, and a simple question: yes or no? The creative team includes Cate McCrea (Set Design), Carl Whipple (Lighting Design) and Barbara A. Bell (Costume Design). David Eppel and David Evans Morris are Production Advisors. Jonathan Draxton (Writer, Performer) was born in Rapid City, South Dakota and raised in Park City, Utah. He recently graduated from Williams College, where he majored in English and Theatre. Soldier will mark his acting debut in New York City. Draxton appeared in the film Escapism, which was an official selection at the 2010 Newport Beach Film Festival. At Williams College, he performed in starring roles in Twelfth Night, Eurydice and The Real Inspector Hound. 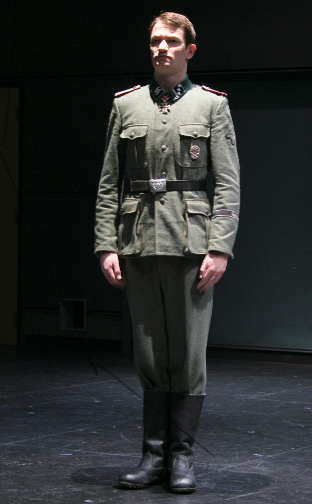 Soldier was created, written and performed by Draxton as part of the Williams College Studio Series, under the direction of David Eppel. Kevin O’Rourke’s (Director) directing credits include Williamstown Theatre Festival’s production of The Physicists starring Roger Rees, Rob Campbell and Brenda Weil, and the NY Premiere of Abi Morgan’s Tender. He has directed at Westbank Café, New Dramatists, Acadia Rep and The Lark Theatre. As an actor, O’Rourke performed on Broadway in Cat On A Hot Tin Roof, Spoils Of War and Alone Together. Most recently, he appeared in Douglas McGrath’s Checkers at the Vineyard Theatre. For the last 2 years he has appeared as Mayor Edward Bader on the HBO series “Boardwalk Empire,” and received a SAG award as a member of the ensemble. He was also nominated for a SAG award for his work on the AMC series “Remember WENN.” O’Rourke’s film credits include Vice Versa, Turbulence, Tattoo, Last Ball and The Aviator. His other New York acting credits include work at Manhattan Theatre Club, The Public, Second Stage, Playwrights Horizons, Roundabout and Primary Stages. Since 2004 he has served as the Artistic Director of the Williams College Summer Theatre Lab. This production is a part of SubletSeries@HERE, HERE’s curated rental program, which provides artists with subsidized space and equipment, as well as technical support. The theater is accessible from the C or E train to Spring St., 1 to Houston St., or N or R to Prince St.